For the first time in a decade, Great Eastern Shipping Co. Ltd does not have orders on its books for buying new cargo-carrying ships as it opts to preserve cash in a difficult shipping market hit by oversupply and rising costs. “Yes, we are preserving cash in a way by not ordering new (cargo-carrying) ships," said a spokeswoman for Great Eastern Shipping. “We are waiting for the right timing to start our next phase of acquisition. We clearly feel that ship values in some asset classes could decline some more from the existing levels," she added, without giving a timeline. The firm promoted by the Sheth family was sitting on a cash reserve of close to ₹ 2,600 crore as on 30 June. Its larger rival, state-owned Shipping Corp. of India Ltd, has a cash reserve of ₹ 2,467 crore but has ordered 27 new ships at global yards worth a combined $1.4 billion. Shipping Corp. owns a fleet of 82 ships. Great Eastern owns a fleet of 35 ships including 25 tankers and 10 dry bulk carriers. Greatship owns 19 offshore assets. In the April-June quarter, Great Eastern reported a profit of ₹ 101.9 crore (standalone) boosted mainly by a ₹ 46.13 crore gain on the sale of ships and other income of ₹ 51.77 crore. “Clearly, the outlook for shipping in the short- to medium-term looks challenging. In tankers, crude demand is a bit sluggish but product demand is resilient. 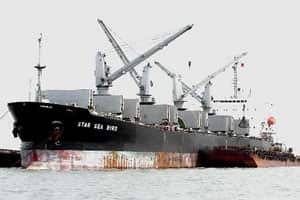 In dry bulk, demand is reasonably firm but it is the sheer pressure from the new addition in the supply that is putting pressure on the freight rates," the spokeswoman said. Between January and September, global fleet owners took possession of 805 new dry bulk cargo-carrying ships, taking the total number of vessels in this category to 8,659, while another 441 new such ships are to be delivered to owners before the end of the year, according to Nick Collins, chief operating officer at the Dubai office of Clarkson Plc., the world’s biggest ship-broker. Overall, as of end-September, 2,819 dry bulk ships were under construction at various yards for global fleet owners. “The number of new ships being churned out by yards is pretty frightening and owners are still ordering the damned thing," Collins said at the India Shipping summit held in Mumbai on 11-12 October. Martin Stopford, managing director of Clarkson Research Services Ltd, a unit of Clarkson, said the coming decade will be about keeping costs down. “This is going to be a cost decade not a revenue decade," Stopford said. “Whereas the previous 10 years were about building ships quickly to meet rising demand, the next decade will be about keeping operational costs under control." London-based shipping consultant and accounting firm Moore Stephens International Ltd’s latest Operating Costs 2011 report, which measures costs annually on a range of indices across the shipping industry, indicates an overall average rise in expenses in 2011 of 3.8%. The biggest climbers are lubricants at 3.6% and crew wages at 3.1%, the September report said. The downturn led Great Eastern to sell seven vessels (six tankers and one dry bulk carrier) in the year to 31 March for dismantling. Since April, it has sold two more tankers for scrapping. In addition, the firm has committed to sell the three oil super tankers it has ordered from South Korea’s Hyundai Heavy Industries Co. Ltd. It took an impairment hit of about ₹ 85.70 crore from the sale as the recoverable value of the assets was lower than the cost. In other words, the sale price was lower than the contracted purchase price. While smaller rival Mercator Lines Ltd has bought into commodities by acquiring coal mines in Indonesia and Mozambique to de-risk from the highly cyclical shipping business, Great Eastern has diversified into the offshore oilfield services sector, a business marked by long-term contracts and stable revenue. “In a way, the investment in the offshore sector is a bit of a de-risking strategy for us," the Great Eastern spokeswoman said. “The outlook for offshore sector is relatively better as compared to current shipping scenario. With oil price staying above $80 mark, almost all exploration and production companies are going ahead with their planned budgets. Charterers (those hiring ships) have also started emphasizing on newer and more advanced assets given the increased activities in deep waters, stringent operational and safety regulations. This should inevitably lead to phasing out of the old fleet, easing pressure on the supply side created by addition of new fleet in recent times," she said.